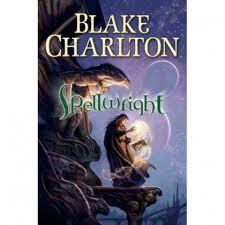 The author bio in Spellwright explains that Blake Charlton was severely dyslexic as a child. That perspective is evident in the magic system in this novel - wizards, druids, gods and other wielders of magic use a variety of languages to write their magic. Magic users are authors, to subdue their ability is censoring and those who cannot use magic are illiterate. Nicodemus, the main character, is an apprentice wizard held back by a disability that affects his interactions with magic - cacography, which is essentially a magical form of dyslexia. He cannot spell his spells correctly, has difficulty distinguishing similar words from each other and spells and magic objects that he touches develop misspellings that cause anything from eccentric behaviour to catastrophic failure. The original magic system is at the heart of what I loved about this book though it was generally enjoyable. A number of other elements of the story are very well-worn cliches, but they're executed decently enough so it's not a problem. I'm looking forward to reading book two soon, I just hope it can maintain the development of the magic system which I enjoyed so much. I'd love to tell you more however today I have very limited internet access - so you'll just have to read it for yourself. It comes recommended for anyone who enjoys a good fantasy read.